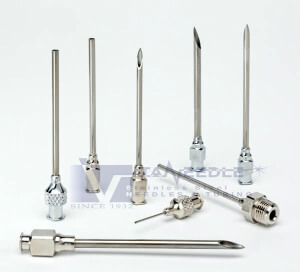 Medical hypodermic needles (or needle assemblies) typically consist of a machined fitting joined to a fabricated tube. Most often, the tube is stainless steel and pointed or blunt (click on cannula link for more details). The worldwide hypodermic needle fitting standard in the medical, laboratory and dispensing fields is the female Luer Lock. The mating part, which provides a tight seal via a quarter-turn, quick-disconnect is the male Luer Lock. 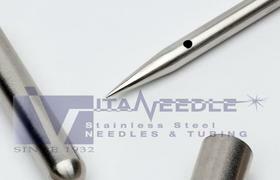 Vita Needle manufactures the highest quality stainless steel medical grade hypodermic needles and cannulas at competitive prices with rapid delivery. 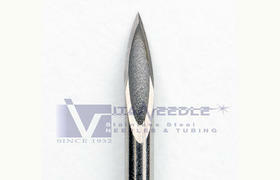 For large volume orders, automated production is used to save on costs and allows for less variation between needles. Lower volume orders call for manufacturing by hand which has slightly more variation between needles, but is quicker and more cost effective. Both methods allow manufacturing to the highest quality standards. We are FDA charter registered and comply with all FDA GMP's. Select from our many stock sizes of hard temper, medical grade tubing (5-33 Gauge) for your cannula or use a custom tube. See our luer lock adapters page for descriptions of our standard luer lock hubs and many hypodermic needle adapters. Metal, typically plated brass, reusable Luer Lock hubs (fittings) are the cost effective choice for repetitive applications or custom sizes not covered by commodity, plastic hub disposable products. 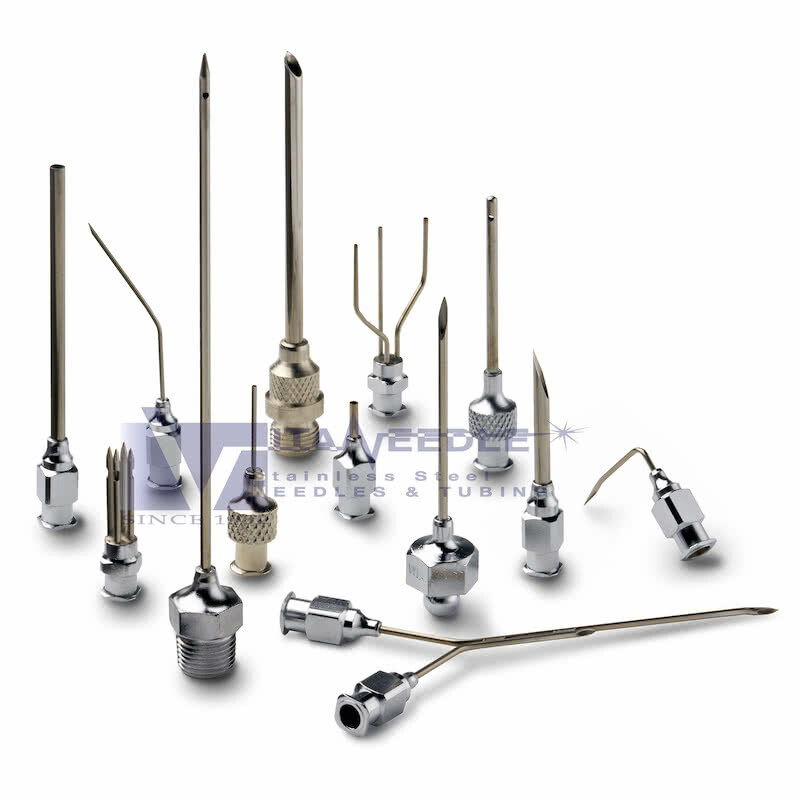 Vita Needle Company also stocks a variety of standard and pipe thread hubs often used in industrial applications. Select a tube size, using standard sizes or a custom size. 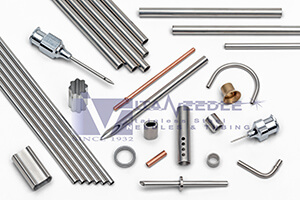 Select your material, typically 304 Stainless Steel or 316 Stainless Steel. For more small diameter stainless steel tubing grades that we carry, refer to our stainless steel alloys. Select a length and point style for your cannula, along with tolerances if critical. 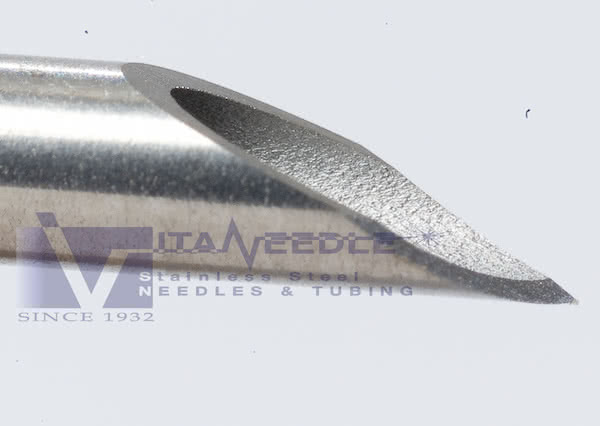 Vita Needle has supplied lancet point needles and cannula for generations and can competitively offer prototype to production volumes with quick turn around.